I recently wrote about how libertarianism is growing and how conservatives, terrestrial talk radio's bread-and-butter demographic, are becoming more libertarian. 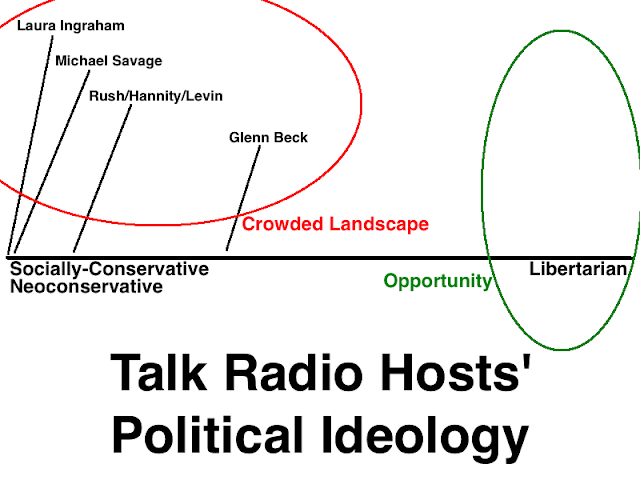 In the article, I argued that there's a growing under-served demand for libertarian terrestrial talk radio. Today, I'd like to add to that argument from another perspective, that of differentiation. Fox News, the only television news provider gearing to those on the right side of the political spectrum, enjoys strong ratings for the simple fact that it's the only conservative news alternative. (Fox Business is a business news--not "news news" network.) As you can see in the following graphic, most television news clusters around the left side of the political spectrum. 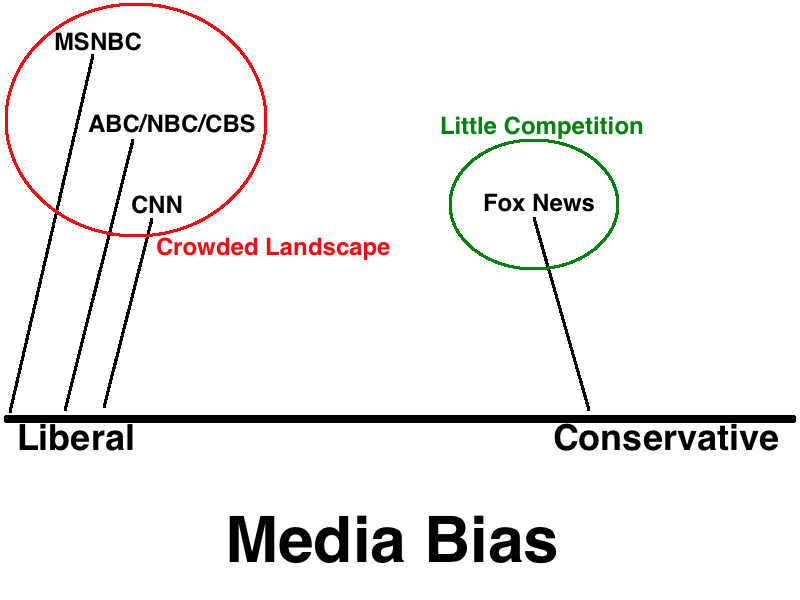 Fox News, on the other hand, enjoys a monopoly on the right. The same principal applies to political talk show hosts on terrestrial radio. As you can see in this graphic, most hosts cluster around the social conservative/neoconservative side of the conservative political spectrum. There's only one prominent host on the libertarian side of the spectrum, Dennis Miller, and his show doesn't get particularly good ratings. The previous 2 graphics, combined with the changing political landscape on the Right, suggest that it's time for program directors to put more libertarians on the air.